packages of what is identified as cocaine. A German supermarket employee got a surprise this week when she opened two boxes of bananas to find them filled with more than 60 pounds of cocaine worth $2 million, police said. "This is obviously a matter of a logistical mistake," a spokesman for the Bavarian State Bureau of Investigation, based in Munich, told CNN Friday. A 26-year-old employee with the discount chain Lidl in the sleepy town of Illertissen was randomly checking the boxes on Wednesday morning, police said. The fresh bananas had just been taken off a food truck, an hour after the store was open, they said. The employee was suspicious of the boxes because they felt lighter than normal, police said. 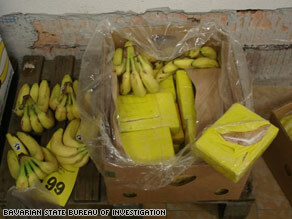 As she unpacked the bananas to take them into the store's produce section, police said, she found 26 small yellow parcels hidden underneath the fruit. She immediately called police. The investigators established that the substance is cocaine and confiscated the goods, police said. The cocaine totaled 28 kilos, or 61.7 pounds, police said. The German shipper who delivered the bananas also made stops at other stores in southern Germany, but police said no other box with cocaine had been found at those stores yet. The freight had come from Antwerp, Belgium, but originated from Colombia, police said. "The drug courier obviously screwed up. He simply was not quick enough," the Bavarian State Bureau of Investigation spokesman said. He dubbed the finding a "discovery by accident." Police said they did not know why the shipment of illegal drugs was delivered to the particular store in Illertissen, halfway between Munich and Stuttgart. The town is right next to a major highway, a North-South route between Scandinavia in the north and Italy in the south. The freight might have been delivered to the wrong address, the spokesman said. Police were not releasing any further details because of their ongoing inquiries. They said they did not know if a drug cartel or a drug courier was using Illertissen as a hub.